Qigong as well as encouraging core strength, flexibility, balance, resilience, fortitude and patience is also a way to explore our relationship both with ourselves and the Tao. 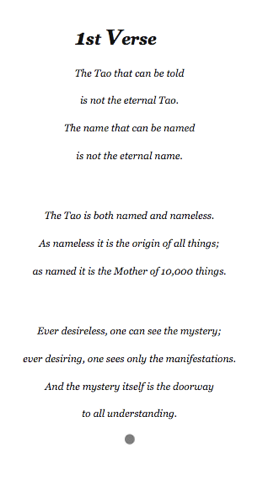 Here is the first verse from the Tao te Ching by Lao-Tzu. This is taken from a book by Dr Wayne Dyer: Change Your Thoughts – Change Your Life, which is a book I really enjoyed reading, and one I refer back to regularly. To launch Homeopathy Awareness Week 2014, the Snooks will be championing the health benefits of homeopathy. The Snooks are colourful cartoon characters appearing in three short animated films aimed at providing potential patients with basic information about homeopathy. The films will be launched on YouTube on 14th June 2014, the first day of Homeopathy Awareness Week. According to a recent AC Nielson survey, while 62 per cent of the current homeopathy users have never tried allopathy, 82 per cent of homeopathy users would not switch to conventional treatments. A new website has been launched that questions the conclusions of the House of Commons Science and Technology (S&T) committee’s “evidence check” report on homeopathy. For journalists and public alike www.homeopathyevidencecheck.org offers an opportunity to fully understand the nature of this controversial report and to reach a more balanced conclusion. Medicines Act 2012 – latest news. Many thanks to all of you who have taken action over the potential threat to the existing supply routes of homeopathic medicines in the UK. The good news is that representatives from the profession have met with the Department of Health and MHRA and have been assured that the authorities continue to be in favour of patient choice and access to homeopathic medicines as it currently stands, and recognise the potential impact to patients, practitioners and homeopathic pharmacies of any changes to the way the act is enforced. Public consultation MLX 375: Consolidation and review of UK medicines legislation. There is still much work to do in improving the provision for access of homeopathy to all of the UK population. You can help! Please click here to tell your story of how you consider homeopathy to have helped you.